Egon Schiele traveling exhibition. 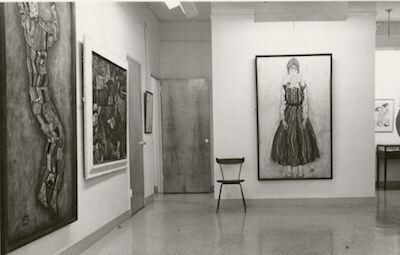 Galerie St. Etienne, 1960. The Galerie St. Etienne’s diverse areas of expertise enable us to provide clients with an unusually broad range of services. In addition to advising collectors on purchases and sales, the gallery assists with authentications and appraisals, and does curatorial consulting for outside institutions. Over the years, the Galerie St. Etienne has developed an extensive body of knowledge about the artists and art-historical movements we represent. We know what is out there, both in terms of the artist's entire production (or oeuvre) and in terms of the location of particular works. We can help collectors shape their collections by advising on the appropriateness of specific acquisitions and locating important items. We can also help prune and refine an existing collection by assisting with the sale of works that no longer meet a collector’s needs. The Galerie St. Etienne often helps curators locate and obtain loans for exhibitions at public institutions. We have assisted in the organization of dozens of exhibitions at museums all over the world, including the Schirn Kunsthalle in Frankfurt, the Tate and the Royal Academy in London, the Guggenheim Museum, Museum of Modern Art and Neue Galerie in New York, the Philadelphia Museum of Art, the National Gallery of Canada in Ottawa, the Isetan Museum in Tokyo, and the Albertina, Belvedere and Wien Museum in Vienna. The Galerie St. Etienne has guest-curated exhibitions for institutions ranging in size from small college art galleries to huge museums like the National Gallery in Washington and the Belvedere in Vienna. We are keenly aware of the considerations--including scholarship, budget and transportation--that shape such projects. Over the years, the Galerie St. Etienne and its directors were responsible for the compilation of catalogues raisonnés on Egon Schiele, Anna Mary Robertson ("Grandma") Moses and Richard Gerstl. We also assisted the authors of the catalogues raisonnés on Gustav Klimt, Oskar Kokoschka and Käthe Kollwitz. The Galerie St. Etienne is an internationally recognized authority on these artists. In 2017, the Kallir Research Institute (KRI), a non-profit foundation, was established to continue and augment the gallery’s art-historical scholarship. The Institute’s primary focus is the work of Schiele, Gerstl and Grandma Moses. Online catalogues raisonnés are planned for all three. If you own a work attributed to Moses or Schiele that is not in the respective catalogue raisonné, the KRI will give you an oral opinion gratis. For a modest fee, the Institute will issue a certificate of authenticity for any work that it judges to be genuine. While the KRI does not give definitive opinions on works attributed to Gerstl, Klimt or Kokoschka, the Institute can provide a preliminary assessment and put you in touch with an appropriate expert if further research is required. The KRI and Galerie St. Etienne maintain an extensive archive and library (including pertinent catalogues raisonnés) to assist in evaluating the work of the artists in whom the gallery specializes. The KRI also provides assistance in researching provenance, including matters related to Holocaust-era losses. For more information, please visit http://kallirresearch.org/ or send an email to info@kallirresearch.org.